C.H. Robinson Project Logistics have recently successfully and safely handled the movement of a transformer which required precise execution. It took detailed planning and extreme care to move the large piece from port to site and that’s what the client counted on when they reached out to C.H. Robinson. The transformer was picked up at the Port of Long Beach in California and transported to the substation site near Las Vegas in Nevada where it had to be manoeuvred through narrow gates to gain entry. The largest piece measured 11.28 x 3.86 x 3.89m and weighed 162.5mtn which C.H Robinson moved using a Goldhofer Girder Trailer System including four trailers and three tractors (one pull and two push) as photographed above. It took almost 12 hours to fully secure the cargo to the specialised trailer which increased its length with the loaded cargo to a huge 95.71m. The 280-mile journey required 4 patrol escorts, 2 pilot vehicles, a mechanic truck and a county supervisor vehicle for transport to the California-Nevada border. Safety considerations necessitated speeds as low as 5mph on ascents and 2.5mph on descents and the transporter made several stops on descents to allow for the cooling and inspection of axles and brakes. After crossing into Nevada, the Highway Patrol allowed speeds up to 30-40mph on certain short sections of road. Once at the destination, careful precision was required to manoeuvre the trailer through the narrow gates into the substation as the entrance provided only three inches of clearance on either side of the trailer. 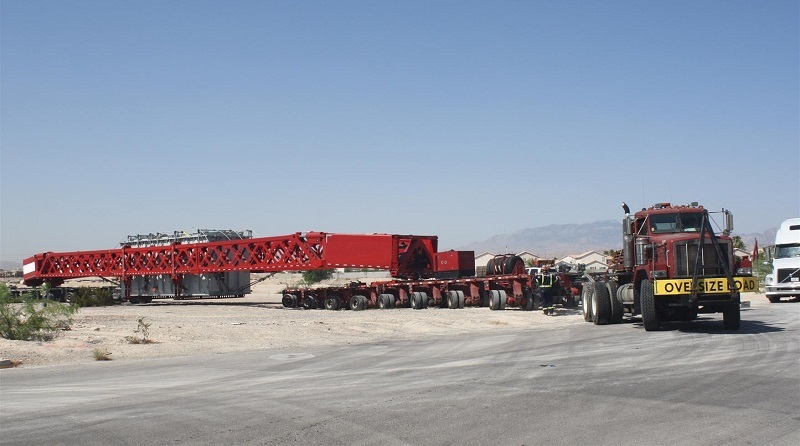 During unloading at the site, the temperature reached 107°F whilst HSE requirements mandated the use of flame-retardant clothing which meant very hot work, taking 10 hours to disconnect the cargo from the trailer and set it safely on the pads. Although it was a challenging and gruelling enterprise, everything came together successfully thanks to C.H. Robinson and the consignee was impressed with the care and precision that resulted in the safe delivery of their equipment.